A 37-year-old woodworker was fatally injured while cutting pulpwood on a private woodlot. He was accompanied by the landowner and both were felling trees when the incident occurred. The worker warned the owner to watch out as he was about to fell a large poplar tree (22” diameter x 75’ tall). The landowner stopped and watched him notch and backcut the tree. As the tree fell, he saw the worker taking only one step off to the side. Instead of one tree coming down, two poplar trees fell. The second tree fell on the victim, causing fatal injuries. WorkSafeNB's investigation revealed that the tops of the two poplar trees were entwined. By taking only one step away from the tree he had cut, the worker actually stepped in the other tree’s line of fall. When felling trees, workers too often don’t recognize the dangers of falling tops, broken branches and kickbacks from stumps. As a result, they do not retreat far enough from the danger zone. Before felling a tree, visually inspect the immediate area and eliminate any potential hazards. Plan and conduct work to eliminate the threat of trees falling together. Contractors, supervisors and workers must ensure that the escape route is clear of obstructions and must use it once the tree begins to fall. 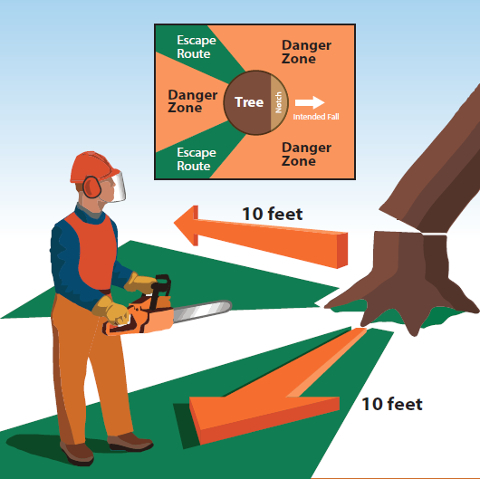 Workers should retreat at a 45 degree angle and at least 10 feet (3.05 metres) from a falling tree.